Reissue of ultra-rare 1977 studio recording originally issued on Sun Ra's Saturn label. Includes renditions of the standards "Nature Boy" and "My Favorite Things"
The third deluxe RA reissue in the new O-Card format from the UMS, released in conjunction with EL SATURN Records is here: A superb reissue of a delicious, seldom heard Saturn Records document from 1970- replete with two alternate takes of a previously unissued classic AND an "Untitled" piece from the original '77 sessions... all available for the first time on CD! "Sun Ra's career-long committment to his Arkestra allowed the pianist and bandleader little time for the elaboration of less populous projects. There were brief, tantalising glimpses, however, into his small group concept-including a rash of recordings made in the mid 1970s. There are, for instance, two great double-LPs of quartet music, tenor saxophonist John Gilmore gloriously forward, made for the Italian Horo label in 1978. 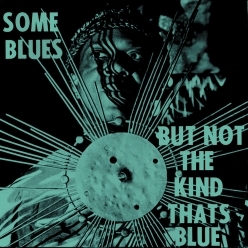 A year prior, a stripped-down group made a set of studio recordings focused on standard jazz songbook material, as well as some original music by Ra, that was issued on Saturn as SOME BLUES BUT NOT THE KIND THATS BLUE.